These letters were written by Thomas Horsefield Wentworth (1837-1917), the son of Sinia Wentworth (1799-1873) and Sarah Ann Horsefield (1808-1845) of Orneville, Maine. Thomas was educated at East Corinth Academy. He helped his father with the farming, hired out as a house carpenter, and taught school during the winter months. 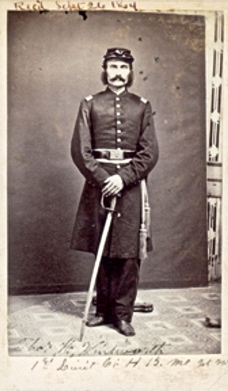 When he was 24, he enlisted as a sergeant in Company H, 15th Maine Infantry, in December 1861. He was promoted to First Lieutenant in November 1863 and was discharged in March 1865. He was with his regiment through all their campaigns in Louisiana, Mississippi, Florida, Arkansas, Texas, and finally in Virginia. He was remembered by his fellow soldiers as “a fine looking officer — as straight as an arrow.” Following the war, he studied law and was admitted to the Maine bar in Penobscot County. He later moved to Bradford and got into state politics. Thomas wrote all three of these letters to his future wife, Abigail (“Abbie”) Elizabeth Wheeler (1840-1939), the daughter of Nelson Wheeler (1807-1890) and Abigail B. Hill (1815-1868). They were married on 30 January 1865 while Lt. Wentworth was home on furlough. It is Sunday afternoon and I am at home. There is no meeting here today so I have stayed at home and from meeting for the first time for as much as one year, anyhow, on Sunday. It has been a long day although I did not get up very early this morning. I read the Book of Revelations through this forenoon with some profit, I trust. This afternoon I have been reading and looking over the singing book and signing a little occasionally. I think that I should get along first rate singing if I had had “Abbie” to help me for you know that it is hard work to sing alone well! I think that I should get along well all day if “Abbie” had been with me for time always passes pleasantly and swiftly when I am with you. But circumstances at the present time forbid and I must be content and hope for a time when circumstances will be more favorable and I trust that I shall not hope in vain. It is almost night now and I am going to the schoolhouse to prayer meeting this evening as there is to be one there at six o’clock. I should like to see you Abbie and have a little confidential talk about matters and things in general and exchange a friendly greeting. This I wish because I love you. But perhaps you will say, “You said that.” Well Abbie, I know it is no use to talk without acting and I think I may have failed in this direction but I can only say what I have said above that “I love you” and if I am not deceived, I speak it from my heart. I told you that I would prove that. If I have not, I still ask for an opportunity to do it. But should I fail at last to prove that fact, then I care not what the next page of the future may reveal. Only give me the assurance of having done right and I’ll try and be content to mark my time but perhaps I do wrong in indulging such thoughts as those and I will bid them be gone. Thoughts are like the passing wind which we cannot retard and which very seldom does any harm. Well Abbie, I will remember thee still hoping to see you soon and hear from you sooner. I will close. Please excuse my improprieties. And now I must go for Father is waiting for me to go to meeting. So good night. You will learn from the date of these lines that I am still in Corinth and that I am thinking of thee — yes, thinking of thee. And you know that Quakers are apt to think more than they say at all times. Therefore, it must be of great satisfaction to think or else thy time that is not spent in talking is lost, but when our thoughts are prompted by love, there is still greater satisfaction. I think of thee because I love you and love to think of you. But Abbie, I miss your presence and company. I have been up to Mother’s quite as often as before you left but there seems to be something gone. I don’t know what it is unless it is Abbie. I have come to the conclusion that that is the trouble and I wish if you see anything of her that you would send her back or let me know where she is for I should like to see her about this time. The time passes rather slowly — especially the evenings. But a few days will soon pass after which I hope to see you again. I hope you are contented and enjoying yourself at home and among your friends. I hope that you will not find any Hurricanes over there, but I’m thinking that they can’t trouble you much. They blow some here yet but have done no damage as yet and it thought that they will disappear as summer approaches. I shall not soon forget the night we met in the parlor nor the many interviews we have had since, but freshest on my mind is the night I left you standing in the door at home not because it was last, but there was words in that look that spoke assurance and constancy that I could not doubt even if I had not another — but I believe I have many. And however much I may have merited them, they are a source of much joy to me. And I think if I may judge that my heart (if not my words and actions) responds in love, but I will see you soon if nothing prevents and then we will speak to each other without the pen. I should like to take that hand tonight in mine and feel its symbol grasp and press those lips which I speak of the affections of the heart. But no! I cannot, and I will close my letter soon and wait till intervening days are past, believing that all will be well. I am as well as usual. Hope you are the same. Mrs. Hunting and family are well. Orisy went home Friday. She did not hang the May baskets but was some snug. School will close next Thursday. I do not think of anything more at present. I take this opportunity to drop you a few lines that you may know that I am yet in the land of the living and cherish a remembrance of thee — the one I love without a rival and without a detracting thought. I hope that I do not use too strong terms to express my honest communications, or what were my communications, but have become by a chain of intimacy delightful realities. “Abbie,” I think of thee very often and wish that I could see you and spend a few hours, if no more, in your society. I told you that I should be home the last of the week but we shall not get mustered into the regiment before tomorrow and I shall not get off before next week. But I shall be there before I leave the state. I am well and contented. Some of the boys have been sick but none of them dangerously so. We are keeping house now and are getting along first rate. We have enough to eat and that good enough, have a good chance to sleep and on the whole a first rate chance, have all kinds of company and can choose for myself those with whom I will associate. We have no marching orders and do not know when we shall be called upon to leave the state. Not before the first of January and perhaps not so soon as that. I hope to hear from you soon. Please excuse this letter for I have written it on the end of my valise. Give my respects to all inquiring friends, &c.
This entry was posted on Wednesday, April 30th, 2014 at 4:21 am	and posted in Uncategorized. You can follow any responses to this entry through the RSS 2.0 feed.